Like, lose your mind a little and swear your kid will still be wetting the bed when he goes to college hard. We all have our pee-in-the-potty-or-so-help-me melt downs, because our kids all have accidents at the most unfortunate times on days when the last thing we need is another accident. And yet, none of them are still wearing Pull-Ups when they go off to college. 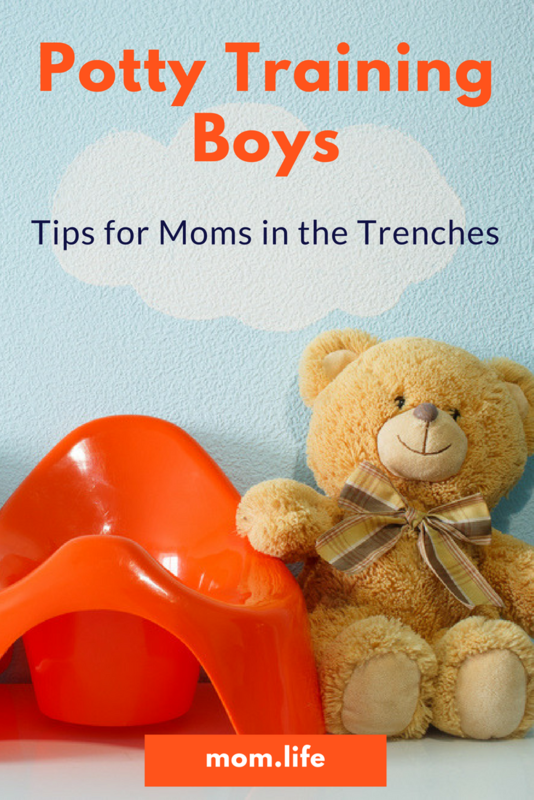 If you’re entering the potty training years, particularly if you’re mom to a boy, here are some things to help you and your little dude be successful. Send your little man on field trips to the potty with dad. They get pretty fascinated when they see things in action. Showing an interest in using the potty is a major one, but there are others to be on the watch for too. Does he grab his little man parts when he’s about to go? Does he like to go hide when it’s time for #2? When your child seems to react to having to use the bathroom, it is usually a good indicator that he has reached a developmental stage where holding it is a possibility. And, just to you know, if you want this whole thing to work, they need to be able to hold it! Right before the birth of your new baby may sound like a great time to graduate your toddler from diapers, only maybe not so much. When anticipating a big change -a move, a new sibling, mom going back to work, asking your child to also take control of his body is maybe not the greatest timing. Of course it can be done, just anticipate that some challenges may arise that make the process a bit more difficult. Be supportive. Don’t shame him for accidents. Celebrate him when he goes in the toilet. You want him to want to do this, not be so afraid of disappointing you or getting in trouble that he can’t. Like, you have to be potty trained by Thursday so you can go into the 3-year-old class! If your kid isn’t ready, he isn’t ready and stressing him out about going into the 3-year-old class isn’t going to up his performance. That’s not to say you can’t potty train your child quickly -you totally can. If the stars are aligned, and you stick to a consistent plan, you really can whip potty training in days. Buuuuuut, there are a lot of if/thens and making your kid sweat it is surely not about to work in your favor. Hands down, the most important choice I made when potty training my three sons was going straight into big boy undies. First, they loved the idea of picking out cool underwear and they hated the idea of peeing in them. Also, not awesome, peeing their pants. They wildly disliked peeing on the floor and having to go through the time and humiliation of cleaning up a puddle of urine. Finally, my middle son came right out and told me that he knew it was okay to pee in his Pull-Ups because, “Mommy wouldn’t even know.” He wasn’t wrong so we reserved those for trips out where we might be in the car or another situation where making it to the restroom quickly might prove difficult. Kids, potty trained or not, are going to have accidents. In fact, you can anticipate that they will continue to do so up until and maybe beyond kindergarten. It’s not weird or even unlikely. Always leave home prepared with a backup outfit and, when accidents happen, don’t make a big deal about it. It’s not like your kid planned to have an accident -it just happened. Clean up and move on. We started and stopped potty training with my middle son more than once. It got to a point where there was just a lot of stress and even more accidents. Everyone was crying and angry and covered in pee. We decided to take a break for a few months and try again when we were both in a different mindset. Worked like a charm and he was out of diapers and into big boy pants in days. Join us in the mom.life app where other real moms chat about all things mommy-ing, including potty training boys (and girls! ).